At 303 Avenida 13 a sign hangs in the entryway stating LIFE IS GOOD AT THE BEACH. 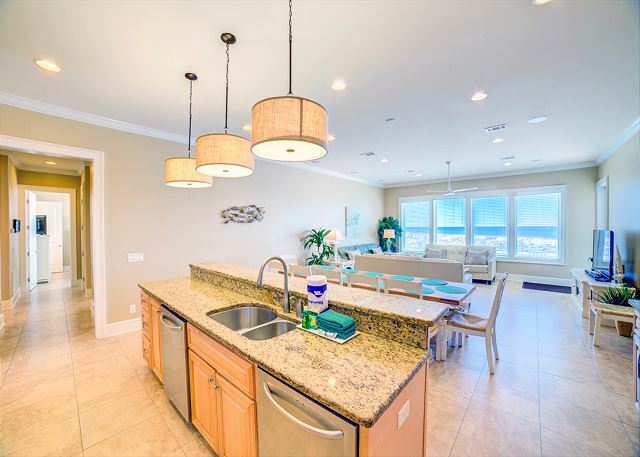 That sets the tone for this 3,200 square foot, six-bedroom, 6.5-bath, and premier Gulf front property. The bright coastal décor and large living area make this home a guest favorite. Entryway stairs lead right into the open kitchen, living and dining area.The kitchen makes meal prep a breeze with granite counter tops, two dishwashers, a large breakfast bar and tons of storage.There are two dining tables ensuring everyone has a seat for family meals.The living area is very comfortable with lots of seating and a high definition 60" flat screen TV (Netflix included!). 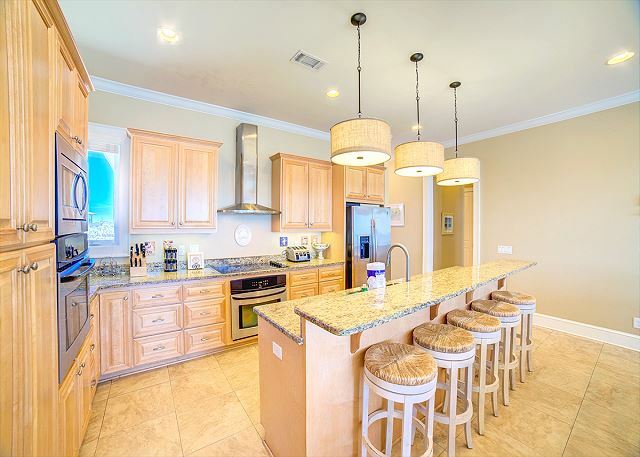 There is also a wet bar with ice maker.This central living area feels very spacious with its high ceilings and picture windows showcasing the views.To the left of the living area are the first four bedrooms. Bedroom 1 has two queen beds, private bath, and opens to the Gulf side deck. 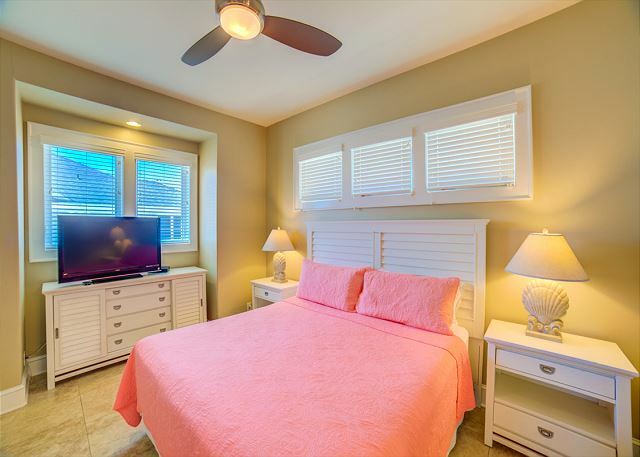 Bedroom 2 has a king bed, private bath with double vanity and walk-in shower, and opens to a private Gulf side balcony. Bedroom 3 has two queen beds and a private bath with walk-in shower. Bedroom 4 has two queens and a private bath with tub/shower combo. 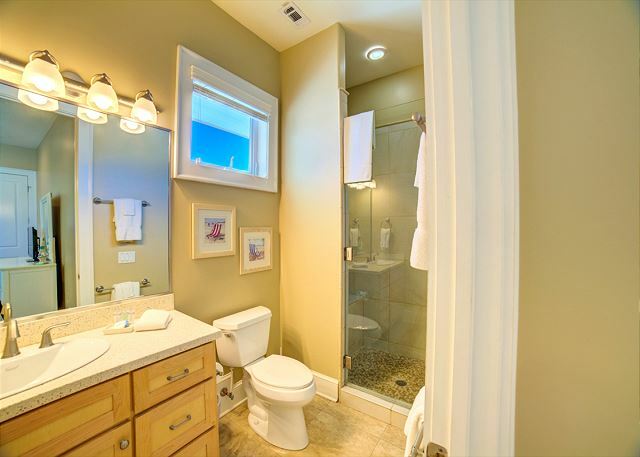 There is also a half bath in the hallway that services the kitchen and living areas. Across the living room is another hallway leading to two more bedrooms. 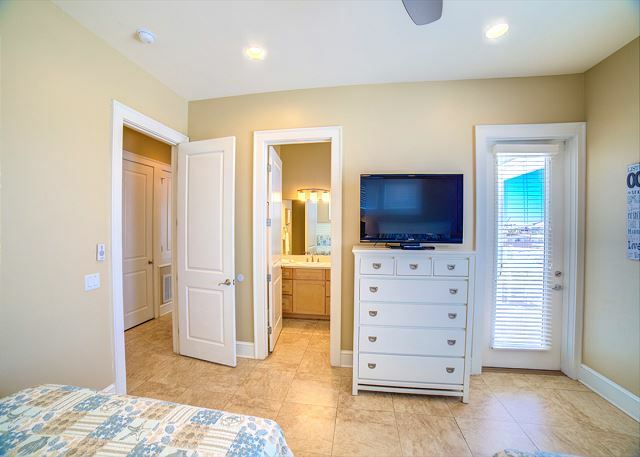 Bedroom 5 has two queen beds, private bath with tub/shower combo, and opens to the front deck. Bedroom 6 has a king bed and large bathroom with walk-in shower. A large laundry room with additional refrigerator is located behind the kitchen. Saving the best for last, the outside amenities of this house are fantastic. The main level deck opens from the living room and Gulf side bedrooms. It has plenty of seating for relaxing and dining. The clear glass railings provide unobstructed views of the Gulf’s unmatched beauty. The covered area under the house is completely open for plenty of parking or more space for entertaining. More deck space is provided with extended decks coming off the carport area. Listen to the waves while relaxing by the home’s private pool. Paradise just doesn't get much better than this! We're so glad you enjoyed your stay at 303 Avenida 13! We look forward to your return! A week in Paradise at Pensacola Beach. We had our entire family with us, that includes 9 grandkids. We had a fun experience as we always do. We have been coming to PCB since 1986. 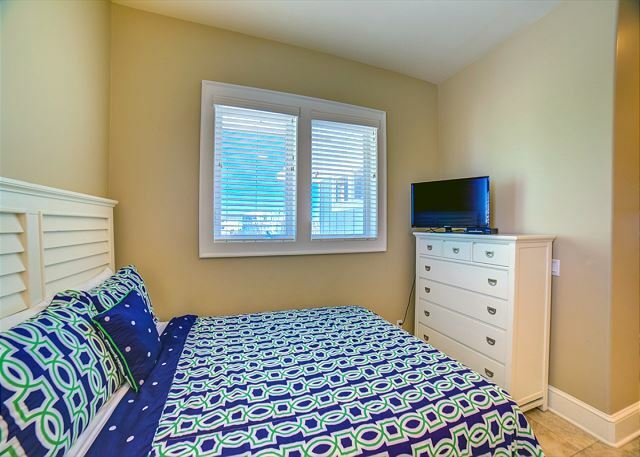 Thank you for staying with Paradise Beach Homes and we're so glad you enjoyed your stay at 303 Avenida 13! We appreciate the repeat business and we hope to see you again soon! We had an awesome time at this property. It was right on the beach plus had a pool. The house was beautiful and had lots of room for all 20 of us. I rented the house for several of us from TN, FL, and AR as part of our family reunion. The rest of the family stayed elsewhere but came over to eat and play corn hole under the carport. Mostly we played at the beach then hung out during the evening either playing corn hole under the carport or on the deck just talking. The carport could use some fans and the deck some tiki torches but overall everything was awesome. The first night we had to have the window AC unit in the play room replaced but again, once that was was perfect. The extra refrigerator in the laundry room and the ice maker were a great benefit for us with so many folks in the house. This is definately a house I would recommend to others! Thank you for taking time to post your review! We are so glad to hear that you enjoyed your stay and made memories that will surely last a lifetime. We hope that you will return and make even more! We had an amazing stay and the house was perfect! There were 11 of us,,,8 adults and 3 kids. The house was well stocked, had plenty of room for everyone and the pictures don't do it justice! It was right on the beach and convenient to everything yet you felt as if you were on your own private beach! The door knobs could all use some tightening, as a few fell off but that was the only issue we had during our stay. Would highly recommend!! Wonderful home. Had everything we needed. We were 3 generations of family and were 14 people and the house worked for us. We were in the house a lot as it rained the whole time we were there. Great shelling. There is a house being built next door so unfortunately the pool area was an uncomfortable place to be with all the workmen watching us. Need to bring your own beach towels, chairs, umbrellas, etc. as none are provided. Thank you for choosing Paradise Beach Homes as your vacation rental company. We appreciate your time in posting this review and we look forward to your return! I rented this home to use as my wedding venue and it was fantastic! The staff at paradise beach homes were all very nice and answered all of our questions, they made everything very easy! The house itself is beautiful, you cant beat the ocean view! Everything was very clean when we arrived and there were plenty of bath towels. The beach is just over a small hill and it was never crowded. Those who were close were very respectful during our ceremony, which we were able to have right on the beach! The carport and deck under the house made the perfect reception spot. Overall, we had a great experience and would definitely recommend paradise beach homes to family and friends! We have stayed at "Our Blue House" for well over 5 years. Each year has been better than the last. It has always been spotless and is always well maintained. The agents have always been most helpful and immediately responsive. I have, in fact, recommended this property to many friends and relatives. Once we arrive, we only leave to pick up ice or a quick trip to the grocery. We never want to leave the property until we have to check out. 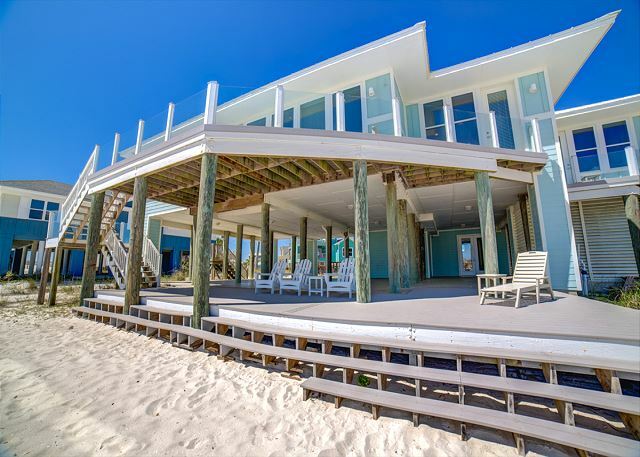 We absolutely LOVE this house and the agents at Paradise Beach Homes. Can't wait until next year!!! We had a family reunion at the beach for our 4 children and their families. Each family had their own bedroom and private bath. The kitchen table was large enough to seat all 12 of us. The beach was quiet and absolutely beautiful. A wonderful place to vacation! Thank you for your review. 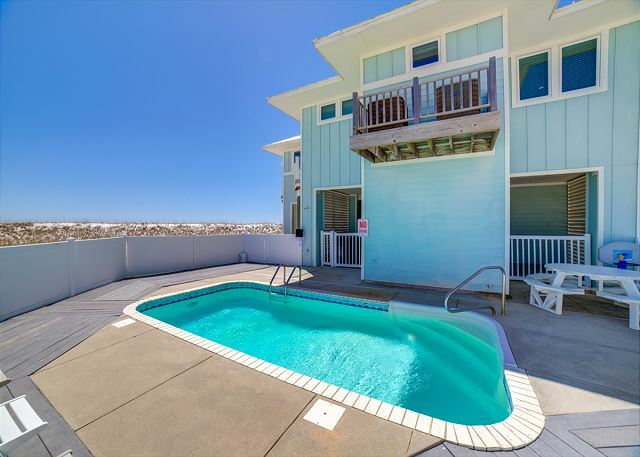 We are glad to hear you enjoyed your stay at 303 Avenida 13 and look forward to seeing you again on your next trip to Pensacola Beach! as always we had a great family vacation! PBH staff very thoughtful !! 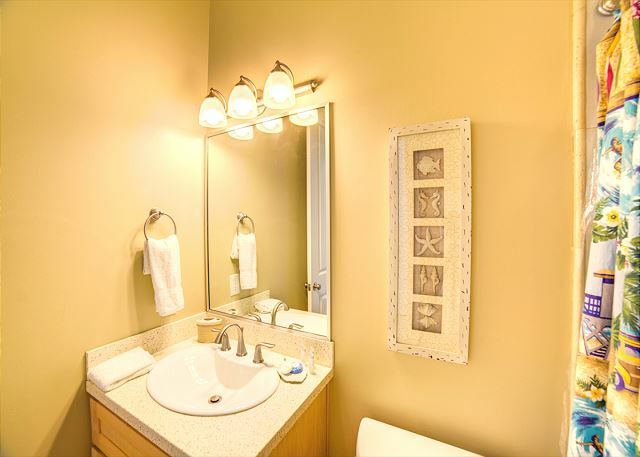 Thank you for choosing Paradise Beach Homes! 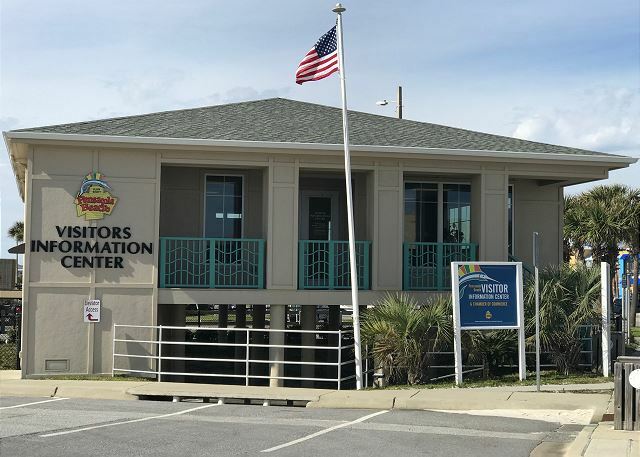 We are happy to hear you enjoyed your stay at 303 Avenida 13 and look forward to seeing you on your next visit to Pensacola Beach. Fabulous house, plenty of space and furnishings for a large group. Beautiful place for our daughters wedding, plenty of space and bathrooms. Overall we had a great experience, the home does show signs of wear and tear. For instance the "Welcome" letting downstairs when you first walk in through the front door is missing the "W" so the sign just says " elcom" and looks pretty silly and it was just inconvenient to have to take down the " elcome" and put it back up after paying an extra $500 for host an event at the home. Brenda was very helpful and professional booking our reservations and accommodating us with all changes and answering questions. I don't recall who the young lady was that originally checked us in but she handed me some papers that she was supposed to keep by accident. I was later called and asked if I had them and told that someone would be by to pick them up, no body stopped by that day. The next morning I received a another call with someone asking me to bring the papers I was mistakingly given back to the front office. I'm sorry, but the day after I get married and after I spend over $4,000 on a rental, I do not want to be correcting your mistakes and driving your papers around. So I thought that was completely uncalled for. Eventually someone did come by to pick up the documents. We stayed at this house with all of our extended family for Christmas. It was wonderful! The house had everything we needed. The location was perfect. The views from the living room were amazing! The house is just steps from the beach. We had a wonderful time! My whole family all together celebrating Christmas! The home was absolutely perfect for our girl's beach trip, unfortunately we had to leave early because of the storm. The management company was easy to work with, we will be renting again! We had booked this house for my wedding on the beach right outside the house. Both my wife and I's family stayed here. The pictures do not do it justice. The kitchen and living area was so incredibly spacious, the 17 people staying there could easily hang out without feeling cramped. With the deck overlooking the gulf and the perfect white sandy beaches, our vacation could not have gone better. It was almost as if we were the only ones on the beach, it was so secluded from the crowds closer to the pier. We have decided this is our new go to spot for family vacations. This house was great for our family - it was a great size with plenty of room in the living areas, and had a great location. We thoroughly enjoyed our vacation rental. There were 11 adults and 5 children. The house more than met our needs. A few nights we had guests for dinner and there was more than enough room. The 2 dishwashers, refrigerators and ovens and the extra 1/2 bath came in extremely handy. The home was decorated nicely and we loved the layout. The pool was a bit smaller than I expected but it was fine. The kids especially enjoyed the 'sandbox' right out the back door. The beach was easily accessible and well maintained. We would definitely rent this home again. We love this house! This is the 3rd time we have rented it and it is perfect for our family. The house is well maintained, beautiful. The rental staff are very responsive. 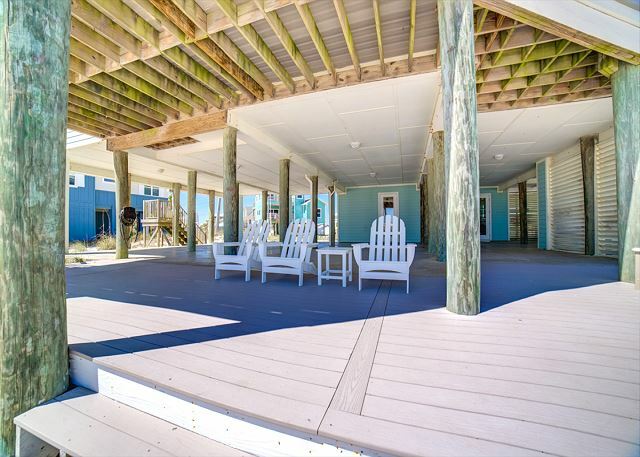 The house has everything you need for a great vacation. Will definitely be coming back to this house! This was the perfect place for our family!!! The only thing missing was a board walk over the dunes would have made it easier for the elders. Great stay. Everyone loved the place.coming back. Our stay at 303 Avendia 13 was amazing! The house was in great shape and we are so happy they replaced the deck! It made the house look that much better! we will for sure be back and stay there again! We were in town for my nieces wedding and stayed at this wonderful house. We hosted a small rehearsal dinner at the house and it was spacious and beautiful. Our family fit very comfortable and the beach was amazing. The only thing that was not great is that my sister in law had to wash her sheets because of sand left in them. We loved have 2 dishwashers and the ice machine was a great hit! This house and location is amazing. We had a house full and a wedding.... still felt like it was plenty of room and so relaxing. No crowds on the beach... just us and the ocean. It was so nice. Thank you! The property was gorgeous and as described. The location was perfect - just a short walk over the sand dune and you are on the beach. The property is well maintained and well supplied. We had a minor problem with a shower head which was promptly repaired. If you have a large group as we did with 6 couples, I would highly recommend this property and its location. We never felt like we were in each others way and everyone had a great time. The beach house view was AMAZING. The location was close enough to restaurants but far enough away from the busy public beach. During our week stay we called the management company a few times due to issues with the house which included dirty/upswept floors upon arrival, washing machine that didn't work and dishwasher that didn't work. They sent a repair man out for the appliances which weren't able to be fixed quickly (new parts which needed to be ordered). The house was very nice, spacious, great location and had a great view. We had three different maintenance employees show up (only one that the office informed us of). There actually may have been more, but we saw at least 3 different people/different times. This seemed fairly invasive, especially because we were usually only dressed in swimsuits. 10:00 am check out was very hard since it was required to take out all trash, wash dishes, tidy up, etc. The house did not seem very clean when we got there. Baby foot prints on the window sill and water on the floor when we walked in. Overall it was a nice stay I just think the maintenance visits should've been reduced, the house could've been cleaner, and check out was too early. We very much enjoyed our week at Avenida 13-303!! 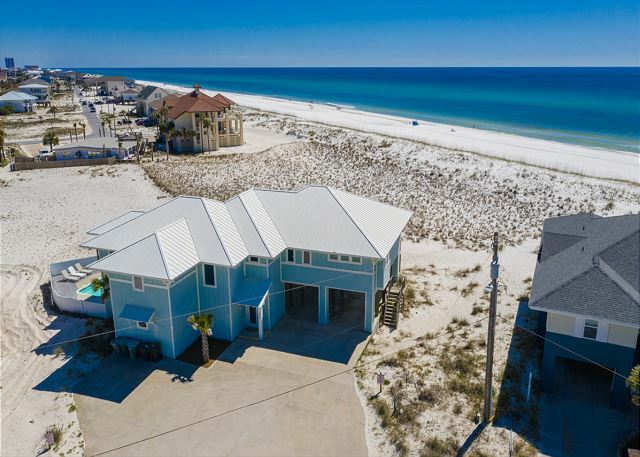 The home is well maintained and in an ideal location right on the beach-- close to restaurants and shops yet far enough away from crowded hotels and condos. We really appreciated the privacy of our own beach space! While the pool is small it is perfect for cooling off and relaxing - so nice to have a pool to ourselves! The house itself is lovely-- high ceilings, wide hallways, and bedroom locations with private bathrooms for each bedroom make it very comfortable and enhance each guest's privacy. The kitchen is updated and amazing- the two dishwashers and two refrigerators are a great bonus! Very spacious and comfortable living room/dining area. We really enjoyed the deck- great view of the gulf!! Highly recommended!! Family Reunion. We had a great time. The house is very well stocked, sits right on the beach and is the only beach-side house with a swimming pool. The rental company was very responsive and easy to work with. Perfect location for our family reunion. We could all be together, yet plenty of room for personal space. The house is laid out perfectly. The kitchen is well stocked. The only negative about our experience every year is always the cleanliness on arrival. Again this year, there was sand in the sheets the first night. The floors were filthy and several bathrooms had mold and mildew. One of the bathrooms had the tub and surround tile replaced but bleach needs to be used to clean the showers. There is no doubt the house is beautiful and for the most part, it was great! The only issues we had were with the cleanliness and maintenance of the property. We spent the first day scrubbing walls and the stick off of surfaces in the house. We also had to pick up trash (over a full trash bag worth) around the house. There was a huge bag of goat feed in the driveway when we pulled up and even after we mentioned it, we still had to dispose of it ourselfs! My dad spent part of one day securing railings and fixing hazardous areas of the deck. When you pay this much $ for a week in a house, I feel like all of this should have been done. We didn't call anyone to come do it for us because we really just didn't care to be bothered with maintenence on our "relaxation" time. Besides, we told management about the goat feed and nothing was done anyways. Also, one roll of tp for a week per bathroom with 20 people, isn't enough. Neither is the limited availability of towels and blankes. .. access to these items would have been nice. Over all I am pleased but feel like there needs to be less lax on overall upkeep in the home. We hosted my daughter's wedding here! It was the perfect house. Kitchen/loving area large, spacious and well furnished for hosting a crowd! The patio underneath made a beautiful reception area. The house was well stocked with any kitchen item you could possibly need! Would highly recommend staying here and using Paradiae Beach Homes! Great family gathering. House was good for our need. In pretty good condition. Mold on east master bath AC register. A little better dusting, shining would help. Wish pool was heated. It would be easy to remove smudges from doors and frames near knobs. 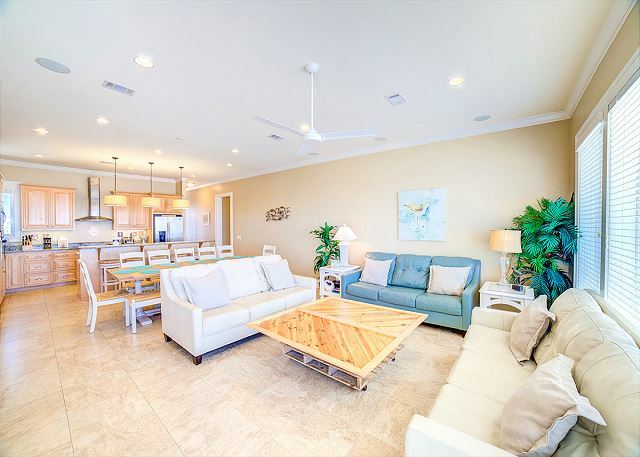 The house is great space for families, we were two families, and it was wonderful, the service of the staff at paradise beach homes was wonderful and Helpfull. The house was very nice and well equiped. Very nice we would defenately would come back. This house was a great for my family! The pool is such a nice feature to give the kids a break from the sandy beach. This is the third time we have stayed in this house. We absolutely love it. Plenty of space for our family and friends. Being right on the beach with the pool for the children is perfect. Will continue to rent this house. Everything was as described. We had a little issue with the AC but they came right out and fixed it. Perfect weekend for a summer wedding. I would stay at this property again for sure! Had a great time! House was comfortable and amenities in kitchen were great! Staff at Paradise Beach Homes were exceptional! Thanks to all. Paradise Homes (PH) was great. Check in was streamlined because of Blue Angels performing. After arriving, a rep from PH stopped by to do a check of the house to make sure it was cleaned properly. Almost all of the issues were addressed within a day. The house is in a great location and the floor plan works great for our family. This is our 2nd yr in this home, so we hope the owners will invest a little money for some upkeep... Lots of mold on the a/c vents, holes in the walls, door knobs falling off, etc. I hope the quality of this house doesn't continue to go down, since we already booked it for 2015. 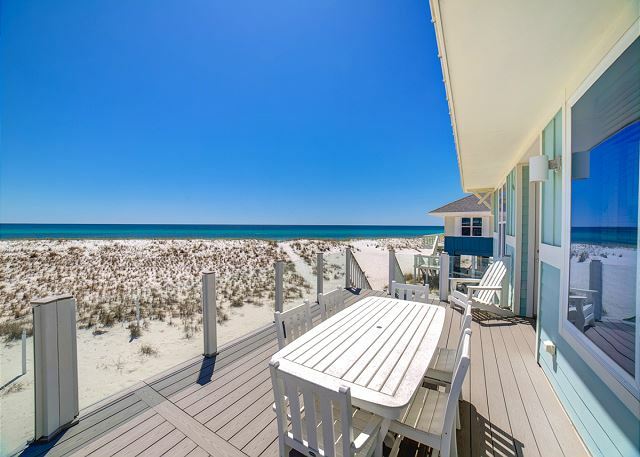 We love, love, love Pensacola Beach and Paradise Beach homes. 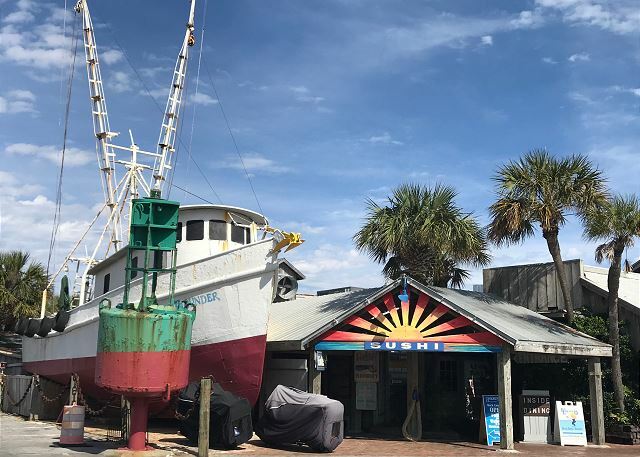 We have been renting every year for over 25 years and always plan our return trip as soon as we leave! The only reason I didn't give 5 stars to the property's general condition was that it was missing quite a few pots and pans. There were lots of pan lids, but had only a few small pans, one small fryer and 2 extremely large crab or shrimp pots. Luckily, my sister rented a house a few doors down and we borrowed a few from that house when we had a large dinner. It now has a very large saut pan in the house, as I accidentally left the one I brought from home in Texas! We'll be back- a great family vacation and lots to do on the boardwalk and downtown Pensacola. We had a great family vacation at this property. Paradise Beach Homes was very helpful in answering our questions before our arrival. There were 20 family members that stayed in this house for a week and there was plenty of room. The kitchen was pretty much stocked with what you need, but we did bring some extras and there was plenty of room to store our items. It was great having two refrigerators, two dishwashers and two ovens, but the cooktop was a little tricky when we had more than one large pan/skillet. A couple of bathrooms need some updating, but overall all they were very nice. Also, no matter when showers were taken there was plenty of hot water. The deck was spacious and like we were told, the pool was very small, but nice for the kids to cool off in. One thing that would have been nice is a bridge/walkway going out to the beach. Walking in the sand uphill/downhill was a challenge for some. Also, there is no view from the area under the house, but it is a nice play to hang wet items. (need to bring clothesline) This is definitely a nice rental property. This was our fifth year staying in this property. 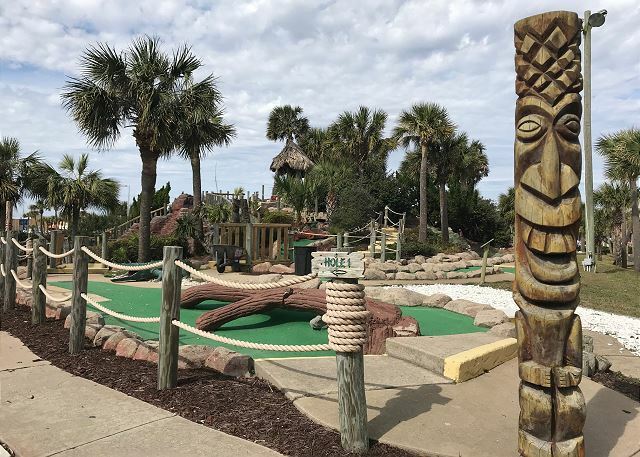 We absolutely love the house, the location, and the staff at Paradise Beach Homes. We are already counting down the days until our sixth year in "Our Blue House". The property is in a fantastic beach location. The house is spacious and laid out well. We loved the area under the house for rainy days. The management company is friendly, and attentive. We will definitely be a return renter!